For some time, there has been a line between alcoholic and non-alcoholic beverages, and applicants have relied on this lack of precedential finding at the Trademark Trial and Appeal Board (TTAB), when clearing trademarks in the beverage industry. However, Joel Gott Wines, LLC v. Rehoboth Von Gott, Inc., Opposition No. 91197659 (June 26, 2013) [citable as precedent], has modified the landscape for clearing alcoholic and non-alcoholic beverages such as wine and water. Before this decision applicants were relying on Cielo S.p.A. V. Austin House of Prayer, Opposition No. 91166590 (September 14, 2007) [not citable as precedent] for guidance. In the latter case, the Board dismissed an opposition that challenged the registration of the mark CIELO for drinking water, finding that there was no likelihood of confusion with the identical marks CIELO, one registered for wine and the other seeking trademark registration for drinking water. The applicant admitted the marks were identical, the products were sold through similar trade channels, and that the two products may be served together. Yet, the Board did not find enough evidence to hold that water and wine originate from the same source, or that circumstances surrounding the sales of the two products are such that consumers would believe that they come from the same source. However, a different holding (citable as precedent) is found in Joel Gott Wines, LLC v. Rehoboth Von Gott, Inc. In Joel Gott Wines, LLC v. Rehoboth Von Gott, Inc., the Board held that the applicant’s registration of the mark GOTT LIGHT for various water beverages is likely to cause confusion with opposer’s previously used and registered marks for wine, under the brands GOTT and JOEL GOTT. It held that the dominant term in both marks was “Gott” and that the marks were similar in sound, spelling and overall commercial impression. Regarding the goods, the TTAB held that “they have been shown to be related, to move through the same channels of trade, and to be available to the same classes of consumers.” The opposer submitted third-party registrations showing that the goods were of the type that would originate from a single source. Further opposer demonstrated that winery branded water is sold in the tasting rooms of wineries. Therefore, consumers can expect that water and wine will emanate from the same source. Considering Joel Gott Wines, LLC v. Rehoboth Von Gott, Inc., is a precedential decision, practitioners and applicants alike would be wise to seriously consider the implications of the decision when clearing marks in the beverage field. Those looking to clear marks in the wine industry, particularly need to proceed with caution, as the TTAB has found a variety of goods and services related to wine for the purposes of a likelihood of confusion analysis. Although there is no per se rule stating beverages and restaurant services are likely to cause confusion when offered under the same trademarks, confusion is found more often than not. 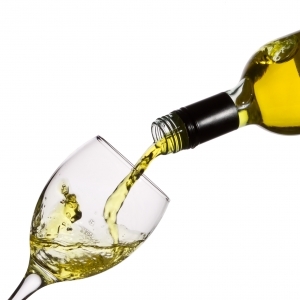 Regarding goods, the TTAB has found the following goods to be related to wine: soft drinks, other alcoholic beverages such as tequila, beer, and gelatin shots, food products such as certain sauces and vinegar, and now you can add water to the list. You can find guidance, under §1207.01 of the Trademark Manual of Examining Procedure (The rules that govern trademark practice at the United States Patent & Trademark Office). In ex parte examinations, the issue of likelihood of confusion usually revolves around the similarity or dissimilarity of the marks and the relatedness of the goods or services. These are issues commonly raised in Office Actions. The other factors typically considered may be evaluated only if relevant evidence is contained in the record. It is incumbent upon the parties to submit germane information into the record. It is important to keep in mind that the issue is not whether the actual goods or services are likely to be confused, but rather whether there is a likelihood of confusion as to the source of the goods or services. Each case must be decided on its own facts.